In the year 1166, the town of Carmarthen in southern Wales was attacked by a rabid wolf, which bit 22 people. This episode was an extreme encounter, but the walls of medieval cities often did very little to keep out wild animals. “Urban Jungle? Wild Mammals in Medieval Towns”, a recent article by Aleksander Pluskowski examines various interactions with animals and how this was perceived by urban residents. While we have much evidence of livestock in city-settings, archaeological remains and other records of wild animals are harder to find. Pluskowski notes the increase in urbanisation across Europe between the eleventh and thirteenth centuries, as new towns emerged and existing ones grew in size. Many town dwellers began seeing themselves as an island of civilization, apart from the natural landscapes as well as rural areas. The presence of wild animals in their streets could often challenge these notions. the urban area was an open ecosystem, accessible to other species living beyond its bounds. These boundaries were not always physical; many towns did not have walls, or only partial walls or permeable boundaries, several developed extensive suburbs and the movement of people and goods in and out of towns provided regular channels for species. Various small mammals could be found in medieval cities, such as rats and mice, as well as semi-independent cats, who preyed on the rodents. When archaeologists examined a well from a Franciscan friary in 15th-century London, they were able to find the remains of 64 individual animals, including mice, voles, shrews, hedgehogs and weasels. They believe these animals had fallen into the well over a fifty-year period. In 1445, the alderman of Rouen took measures to repel wolves prowling around the town walls. Wolves penetrated the bounds of Evreux in 1400, most likely attracted by the concentration of animal waste and deadstock generated by the urban population. Wolves emerged from the woods surrounding Paris (used as royal hunting grounds) a number of times in the first half of the fifteenth century, consuming carcasses or even attacking people on the outskirts of the city. Pluskowski concludes by noting there is more opportunity to study the “medieval urban ecology” as it can offer some valuable insights into how urban residents conceptualised their towns when faced with the presence of wild species. The article “Urban Jungle? Wild Mammals in Medieval Towns” is part of Animaltown: Beasts in Medieval Urban Space, edited by Alice M. Choyke and Gerhard Jaritz. It contains 19 articles that cover a wide range of topics related to how medieval towns kept, regulated and interpreted animals. You can learn more about the book from Bar Publishing. To read more of the research of Aleksander Pluskowski, please visit his Academia.edu page. 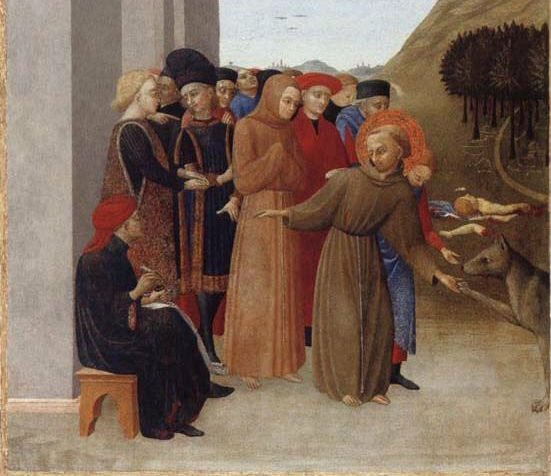 Top Image: Saint Francis and the wolf of Gubbio, from San Sepolcro Altarpiece (Sassetta, 1437–1444) – in the story Francis is able to confront a wolf that had been attacking the townspeople, then bring it back tamed.